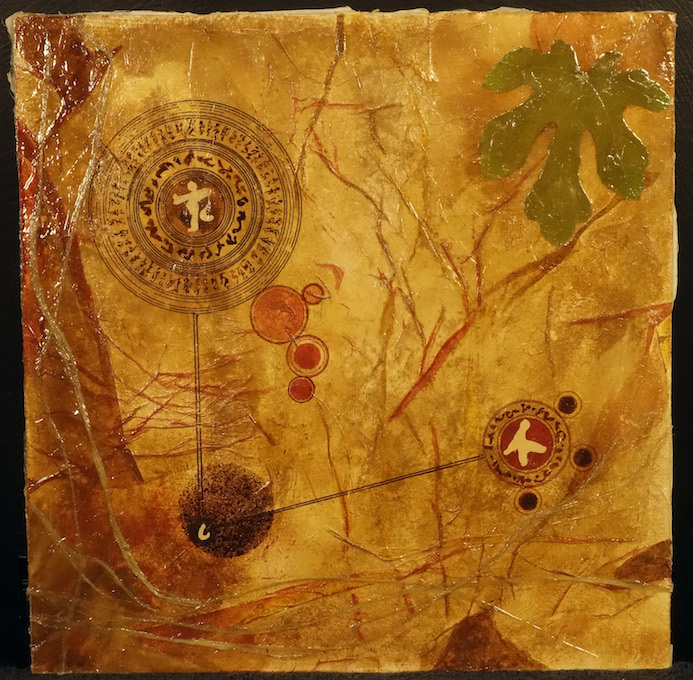 Over 30 years, I have always tried to find new and interesting ways to bring elements to my paintings. Paint is more than color to me. It is texture, process, product, inspiration and the medium itself. Golden offers one of the best lines of mediums, gels, inclusions and products to produce an infinite number of results. The more I play the more I learn about this medium. In a workshop I named, The Medium is the Message, we have students explore the range of media and how their voice can be brought forward on canvas, board, paper and numerous surfaces. When we understand the basic workings of the polymer, we can build interesting works… the medium literally mixes with our voice and shouts a fresh new perspective all the time. This work is a combination of fine pumice and coarse pumice to give the work a contrasting voice. These were applied on a canvas mounted on board. The color is ink which is possible to work right into the fine media because of its receptivity to layers above it. The marble dust which is in this media is a popular one for artists who like to draw into their work. The yellow color is heavy gel media mixed with a bit of indian yellow hue. When dry the translucence shines through. Blue becomes green where the two cross. But also this adds a layer of thick impasto to the board. This is a finished version of the technique seen above. 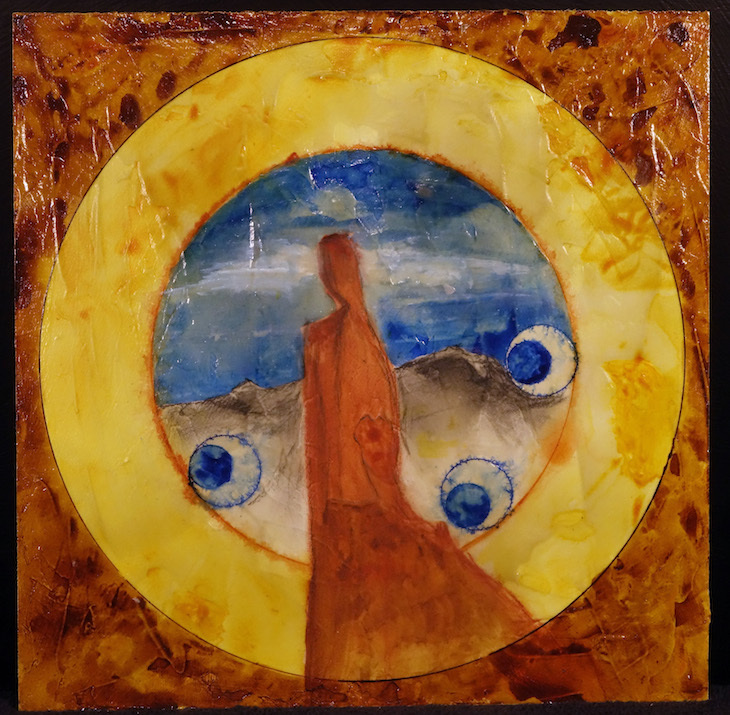 The contrast of coarse and fine, the layering of color, and finally the gel medium bring this work into a new level. When we consider our paintings from the beginning as a process of layers, then depth is revealed even in the most abstract of work. 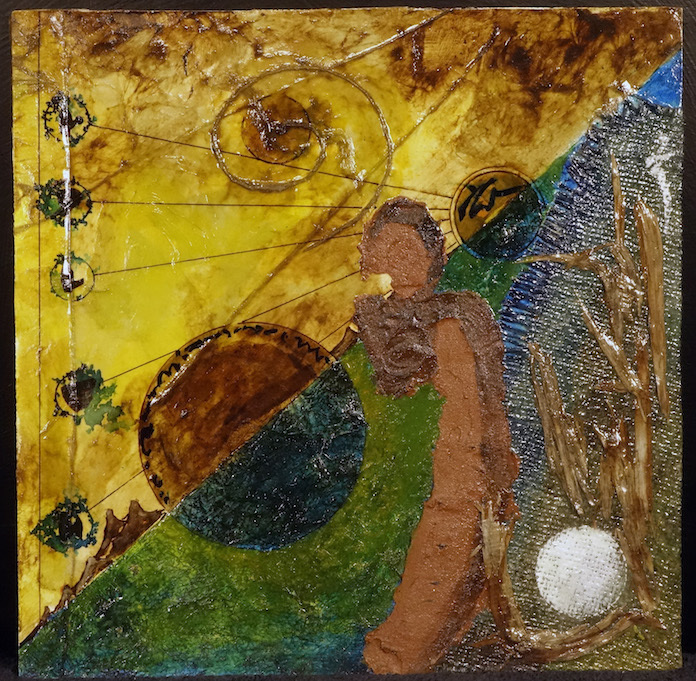 One of my favorite things about Golden media is it can be combined with dirts, fibers and all sorts of elements which the artist can bring to the studio. 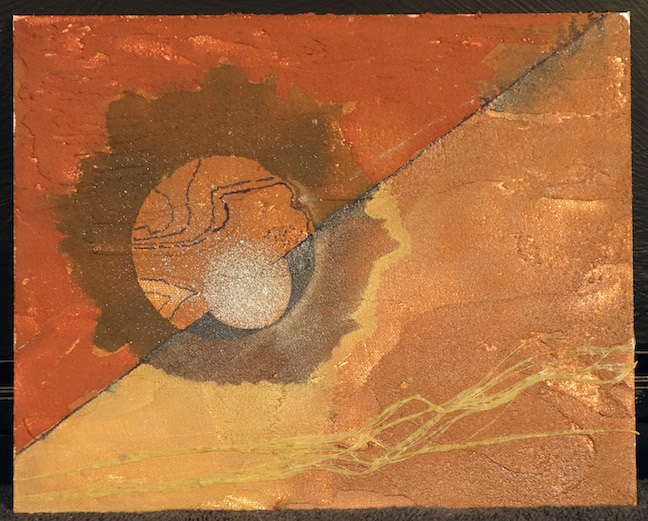 Here red sand is mixed with soft gel media and a bit of GAC200. This is then spread on the board. Interesting ink, watercolor and even paint effects can be layers on top of the dirt which gives it a glowing effect. In this board I also mixed Amate fibers and attached them along the bottom. This unfinished work can be built up over time to create some very textural effects. 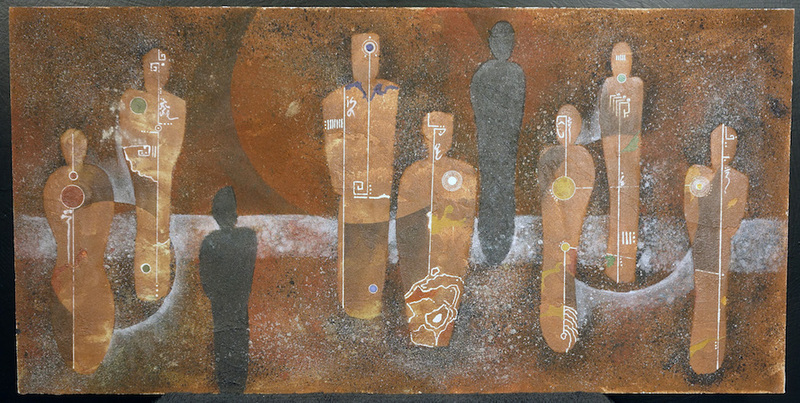 Modern Ancients is a completed work using the sand technique, layers of stainless steel paint, sepia, and red oxide as well as paynes gray, and pearl media. The last layer was the white lines which are added using an inking tool to get precise lines. 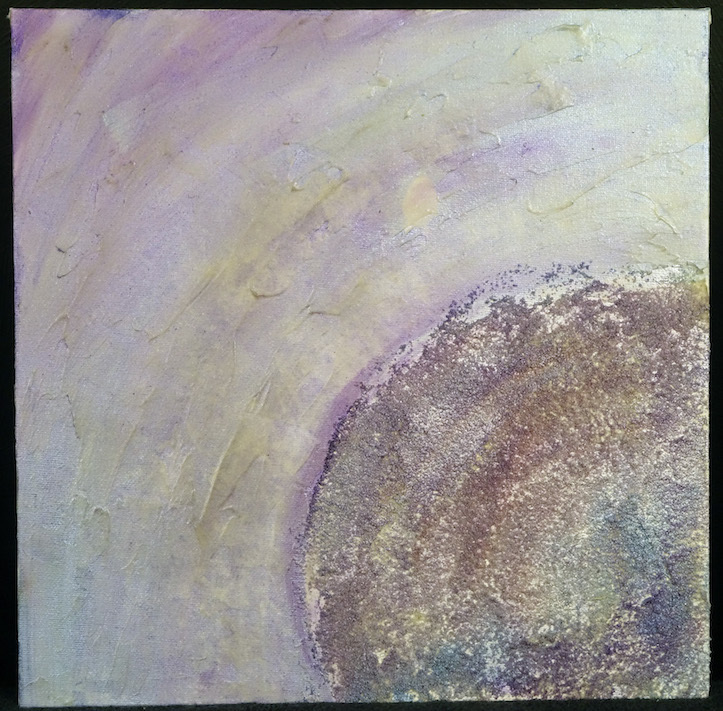 Moon Beam is a technique of adding Japanese paper to a canvas board. Because the media is used as a glue below the paper, the paper stays receptive to some amazing additions of color right into the fibers of the paper. This presents the artist with a method of drawing on papers or adding papers and then using watercolor techniques as a layer for a painting. My love of paper and paper fiber has brought this technique into almost all of my paintings. And it offers that linear and geometric feel which I like to be added at any point in the process of painting. The upper and lower boarders are unfinished, but are made of sand. Thus one can see various techniques being added together. Again, here is the technique in a finished work. 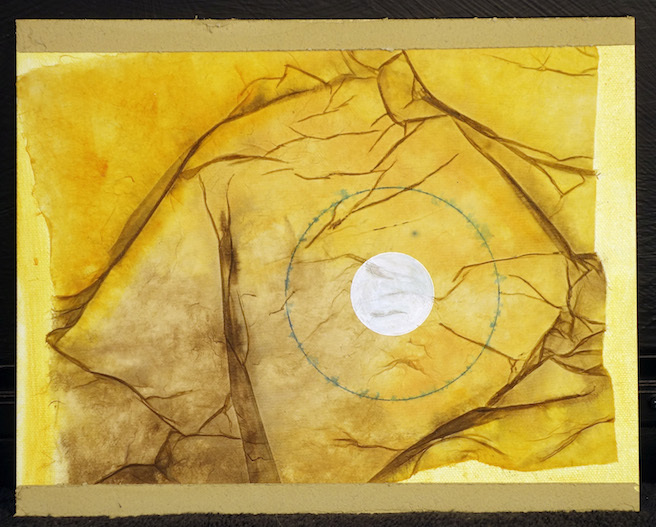 Also added are Amate fibers, detailed painting with inks and drafting tools, areas of wash, and manipulated paper. 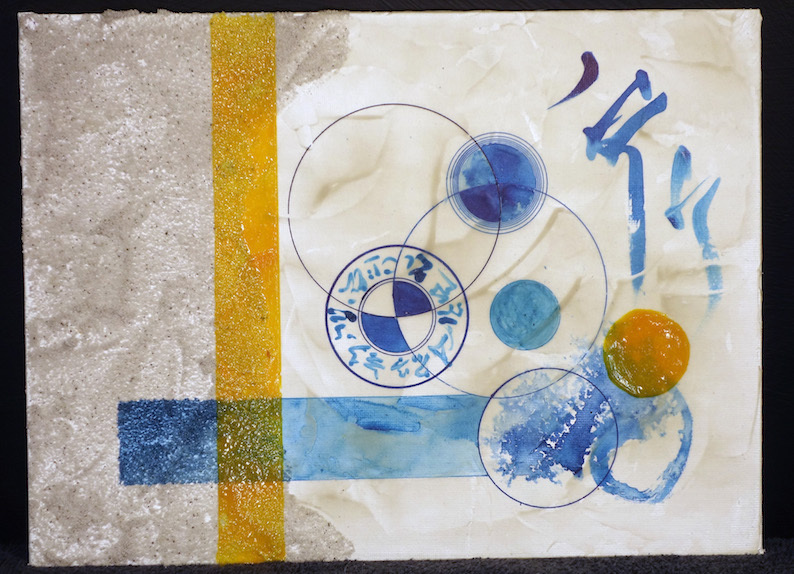 The final layer is a thin layer of GAC800 which acts as a varnish to protect the paper. 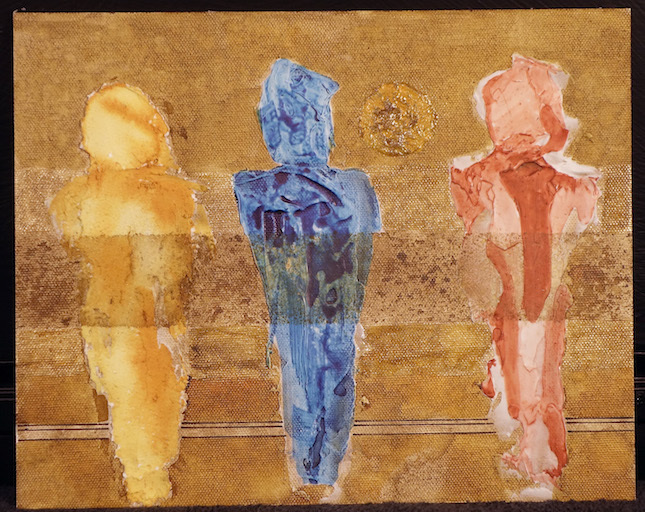 And thus this work can be framed without glass yet still communicate what paper communicates to the viewer. Last, a fig leaf is added using extra heavy gel media. It takes several days for this to completely dry, but when it does, the leaf shines through. Being trapped within the layers, the leaf is stable. To limit its breakdown over time, Golden has created a UV varnish as a last layer when a work is complete. Again, Golden lives up to its name. Molding Paste comes in several varieties each with different potentials. Here three of them, light, medium and heavy, from left to right, are combined together to produce an interesting variable effect in each being. After it dries, color can be added with varying reflections and surface tension. The light molding past is porous and receives the paint. The medium has a bit of a resistance and the heavy is like working in hard clay. The circle is a combination of fiber paste and color. The background for this work was a light wash in ink disturbed with water. Then the molding paste was added. Thus even the canvas can be stained before working on the ideas. Crackle paste and fiber paste contrast here to allow a different voice. The thicker the crackle the more dramatic the cracks. One can control the cracking a bit by adding in GAC100, but in general its a great medium for extreme texture. The watered down read then flows into the cracks which accent them. Fiber past is probably my favorite medium to add to a painting. It gives me extreme texture to play with and takes watercolor style stains and layers. Around the work, in the sky as it were, yellows are layered one on top of the other using a glazing technique. Then heavy gel is layered without color, allowed to dry and then more glazing. Thus one can manipulate the light affects in a work. Who says we can plop color onto canvas and call it good? This is absorbent white ground, prussian blue and ultramarine mixed literally on the canvas with a ton of water. Water breaks the polymer bonds away from each other and creates a swimming and mixing effect with blues. The result is a massive puddle of paint which takes a while to dry, but gives some interesting effects. Absorbent white ground can be drawn into as well and takes layers on top nicely. At the bottom of this is sea sand painted with blue and then sanded down. 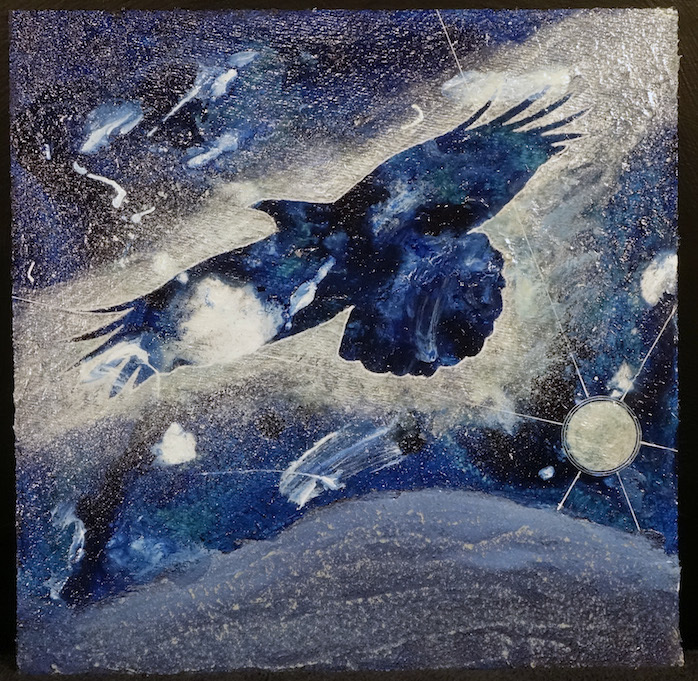 pearl medium created the outline to the raven. The work glows and shines as a result of these many layers. 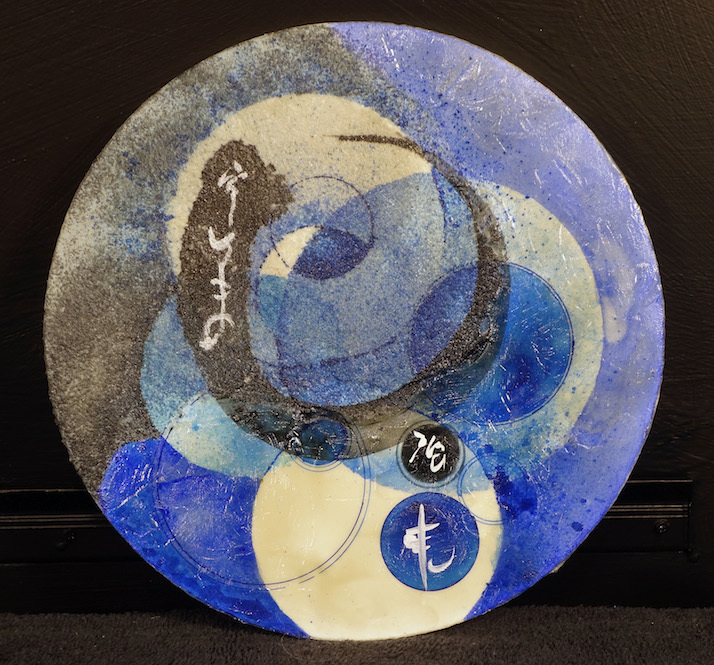 I am not a person who uses a lot of pearl and shine in my work… This piece, from the workshop, is that wonderful contrast between coarse and fine pumice and applied in a way that gives this an out of this world affect. Love the purples and shine to the paints added on top of that base with tons of water which allowed the final layer to dry like a watercolor painting in acrylic. After completing a painting, we can varnish the painting with matt media, satin, and gloss. Here the three are used together to add contrast to the work. Finally, this last work is a completed work with a ton of mixed media and ideas all together. 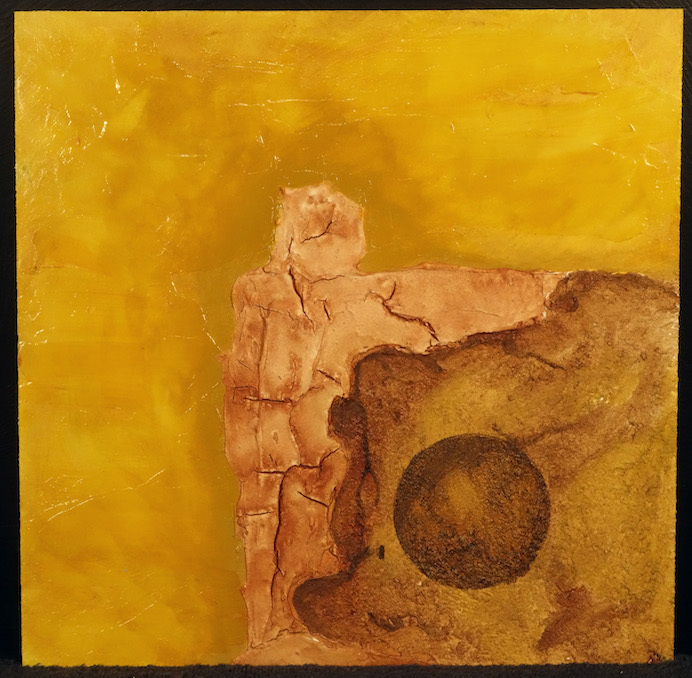 Sand, dirts, fibers, cloth, even tree bark is added into this work with ink, paint and varnish techniques. Golden as created a line of media that brings any person into the studio with intuition and simple techniques. Anyone can experiment and get results. The sky is the limit in mixed media. Special thanks goes to The Art Store in Prescott AZ for their support of these techniques and teachings. I am available to teach this workshop and ways… its all about the media… the message reveals itself in the process!! !